To me, those moments of synchronicity, happenstance, miracle, chance, and luck are gifts from All-That-Is (God, the Universe, Source Energy, Higher Coach—whatever works for you) that we open the vibrational-door wide enough to receive. One of those moments fell into my lap as I sat down to write today’s blog and was wondering what I would focus on in a short amount of time as we have family coming in today and there is lots on my to-do list. Having just finished my workout and eaten my breakfast, I made my way into my office with my steaming cup of lemon-green tea and fired up my computer. As always, I checked my emails first, and there was one from Abraham-Hicks, one of my favorite spiritual teachers, offering a free preview of the first 10 minutes of a workshop, so I clicked on the link. Not having read the fine print, what I didn’t realize was that the offer was to see the first minutes of a live workshop and once those 10 minutes were over the channel would be taken down. I just “happened” to click on the link just as Abraham welcomed the workshop participants—live and in real time. My timing could not have been more perfect! And the words that I heard in those 10 minutes were a direct answer to a question I’d been rolling around my mind for the past couple of days. What a beautiful gift that I appreciate to my core! Those types of gifts are coming to us frequently, but often we are so distracted, overwhelmed, and disconnected that we don’t recognize them for what they are and we literally do not receive them. They can range from the simple to the profound. 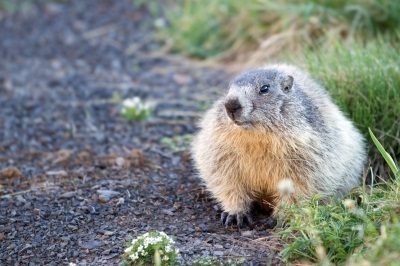 For instance, just a few days ago, my husband and I were driving along and we saw a groundhog foraging on the side of the road. It was so fun to see this cute creature and I exclaimed out loud, “I love groundhogs!” The next day we were eating dinner and a groundhog came through the fence into our backyard and stood on a wall about four-feet from our window. He just stood motionless right in front of us for a good five minutes. It was as if the Universe was giving me the gift of an uninterrupted view of this adorable creature so that I could have more of something that I love. And just yesterday, a friend who is a single-mother who was having significant financial problems won over $100,000 in the state lottery. While this was certainly a profound gift for her, it was also a gift for me on so many levels, but primarily it was a blatant reminder not to tie God’s hands in the myriad of ways prayers can be answered. It’s our job to ask for what we want and let go of “how” the answer or solution may come. One of the things that I was opened to this week was when we become aware of those gifts from the Universe to not only fill our hearts with appreciation, but to joyfully ask how this moment can get even better. And then to watch as more examples of joy, abundance, and love fill our lives. There is no end to the gifts that Source Energy wants to bring us. The better life gets, the better it can get. What can you do to reframe how you see those moments of synchronicity, coincidence, happenstance, miracle, chance, and luck and begin to see them as gifts from All-That-Is? How does that change how you receive those experiences? And with gratitude and appreciation in your heart, what can you do to remember to joyfully ask how the experience could get even better, and watch for the miracles to unfold? This entry was posted in Appreciation, Spirit and tagged Abraham-Hicks, All-That-Is, Appreciate, chance, conincidence, Energy, Gifts, God, groundhog, happenstance, Happy, Health, healthy-living, Inspiration, Joy, Law of Attraction, lottery, Love, luck, mental-health, Mind Body Spirit, miracle, Positive Thoughts, Source, spiritual, spiritual teachers, Spirituality, synchronicity, Universe, vibration, Workout by Goss Coaching. Bookmark the permalink. what a way to start the day! Thank you, more please!! I know! Looking forward to the groovieness! Synchronicity: my word for the day. I will look for it – recognize it – appreciate it – and think of you and your blog each time I thank God (your “All-That Is”) for His mysterious ways! Thanks for writing. Love it! Hope you recognize many gifts! What a wonderful post, Hanna!! I loved the part about the groundhog. Thank you, Joyce. So appreciate you! Love it love it love it! More please indeed!